These festive lemon and sour cream star cookies are a fun addition to your holiday cookie repertoire. For Cookies: Beat 2 cups flour, sugar, butter, sour cream, eggs, baking powder, lemon extract, baking soda, vanilla extract and salt in a large mixing bowl until well mixed. Stir in remaining flour. Divide dough into 4 equal portions; wrap in plastic wrap. Refrigerate for at least 2 hours, or until firm. Roll out 1 dough portion on a well-floured surface to 1/8-inch thickness. Keep remaining dough portions refrigerated. 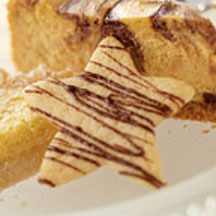 Cut with a 2 1/2 to 3-inch star-shaped cookie cutter. Place 1 inch apart on ungreased cookie sheets. Repeat with remaining dough portions. Bake for 8 to 12 minutes, or until edges are lightly browned. Cool on baking sheets for 2 minutes; remove to wire racks to cool completely. For Topping: Microwave morsels and vegetable shortening in a small, heavy-duty plastic bag on HIGH power for 1 minute; knead. Microwave at additional 10 to 20-second intervals, kneading until smooth. Cut tiny corner from bag; squeeze to drizzle over cookies. For Sour Cream Cut-Outs: Omit lemon extract; increase vanilla extract to 2 teaspoons. Prepare as above.